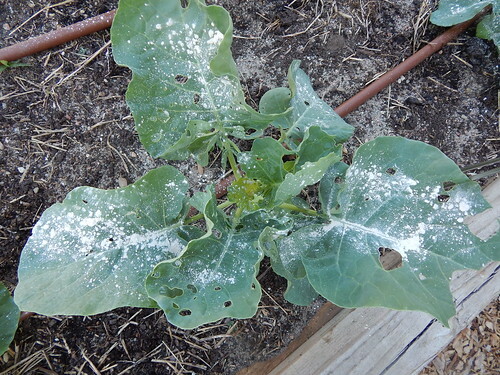 Outwitting the squash vine borers is one of the ongoing themes in the garden this summer. 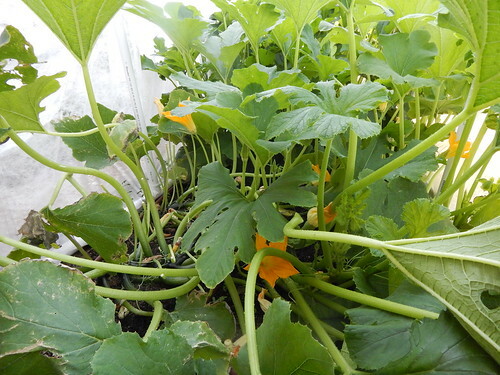 Let’s take a look at our parthenocarpic (no pollination needed) squash trial. This is the fancy cage we built for the row cover over the squash. We hadn’t really made new row covers/low tunnel frames for the new raised beds yet, so this seemed like a good opportunity to try something new. One of the things that I’ve always struggled with on our raised beds is how to manage the lower edges without resorting to a bunch of bricks or milk jugs of water. I had this idea to use a PVC frame along the bottom edge that the row cover could be clamped to. We also decided to make a larger, square frame because the squash get big, especially under cover. The biggest problem we’ve had is that there’s no good way to open the row cover when we need to get in and work on the plants or harvest. When we take the clamps off, it tends to tear the fabric. So…it’s a good idea, but still a work in progress. That’s what the clamps look like, in case you were curious. The squash under the row cover are looking quite jungle-esque. This is pretty typical when you have plants under a row cover. They are protected from the wind and they are slightly shaded, so they tend to get a little bit tall and leggy. You can see the longer, skinnier stems on these plants compared to what you might expect. It’s also nice and warm under the row cover, so the plants grow quickly. As you can see, we are starting to get some flowers. 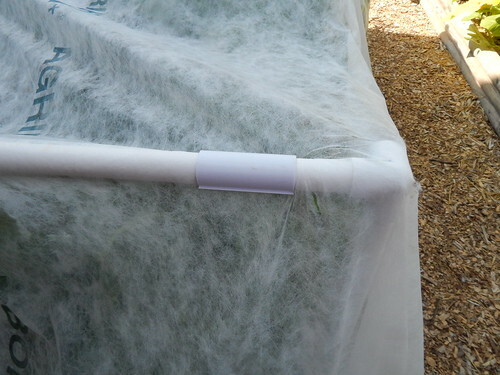 With most squash, when using row cover to circumvent the squash vine borer, we would take the row cover off right now. However, since we are using parthenocarpic varieties that supposedly require no pollination to set fruit, we shouldn’t need to do that. It will allow the protection to continue until we take the row covers off. So…is that translating into squash? As you can see from this picture, the answer is not so much. 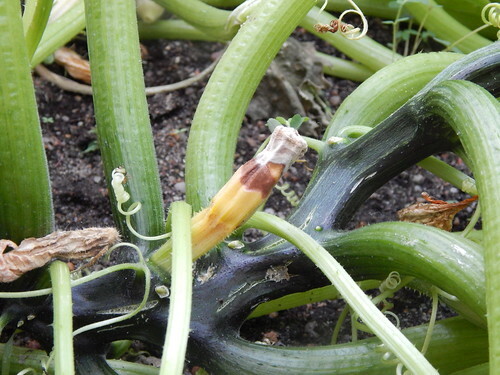 There are several squash that are clearly rotting and have not successfully set. Now, it could just be early and this will straighten out. It could be that the varieties we picked are only partially parthenocarpic. Or it could be that the project is a big bust and we’ll have to take the row cover off to get any zucchini. I looked up the varieties we chose to see if there was any data on how they do. ‘Partenon’ was listed as setting fruit 69% of the time parthenocarpically. I didn’t find any data on ‘Segev’. So, we’ll see how things continue! 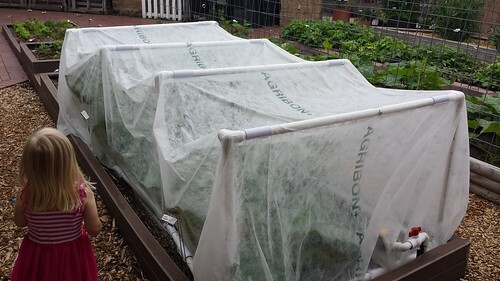 The plus side is that even if we have to take off the row cover now, the plants should be large enough to withstand quite a bit of squash vine borer damage before they die. This is a good example of why it is worth it to take a closer look when you see something abnormal going on in your garden. 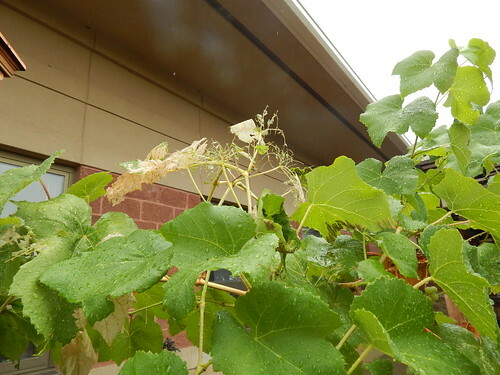 I was out in the garden a few days ago and noticed that there were a few leaves on the grape vine turning brown. I kind of mentally shrugged and figured that maybe a few spider mites or something was happening or maybe just a little leaf drop in the later part of the season. I noticed it again yesterday as I walked by, and then did a double take when I realized there were leaves that looked chewed on. Oops. Then I took a closer look and found two things going on. This dude is a sphinx moth caterpillar, happily munching on the end of the shoot. Although he is eating quite a bit, I’m not concerned that he will kill the plant and just decided to leave him alone. If you look on the left side of the picture, you will also see some other insect feeding damage, but that wasn’t done by this guy. Oh no, all that damage was done by these cute little larvae. I suspect they are either grape sawfly or grapeleaf skeletonizer, based on their appearance, but I haven’t had time to do any more research. 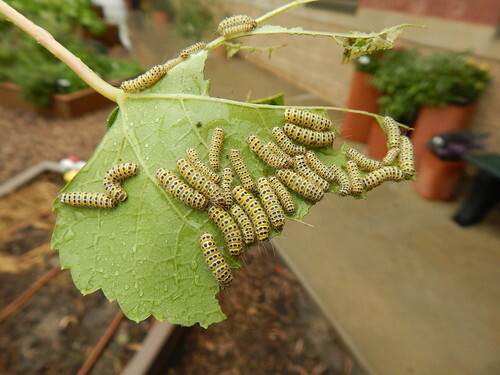 One of the Extension articles suggested picking off the leaves with the larvae on them, because grapes don’t mind a little leaf thinning. I picked about 10 leaves off that were heavily infested and we’ll see if that stems most of the problem. 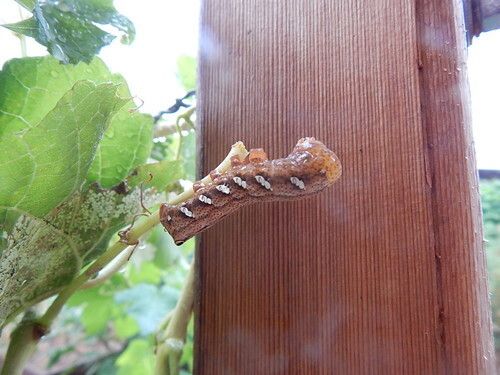 I doubt that they would seriously damage the vine at this time of year, but it is still a good thing we caught them before the whole plant was munched up! 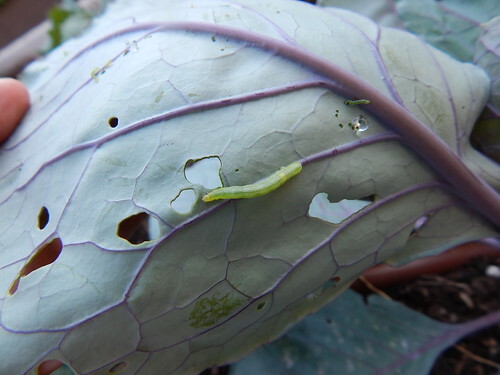 Just when I thought we had the cabbageworms under control, another caterpillar comes along and attacks another plant. This time it’s the sweet potatoes! The sweet potatoes right by the door have taken on a rather holey appearance over the weekend. **Sighs** Now what?!? 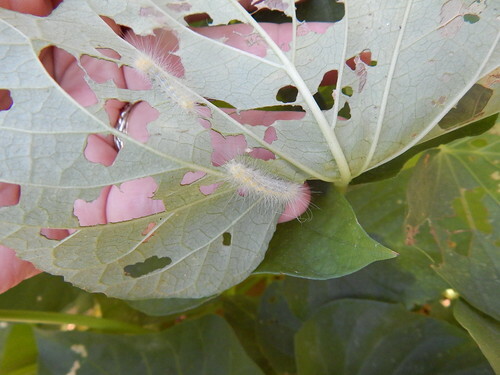 They look a lot like tussock moth caterpillars, very similar to some that we had on the sunflowers earlier this summer. Sweet potatoes are supposed to be relatively trouble free, so this is a little surprising. 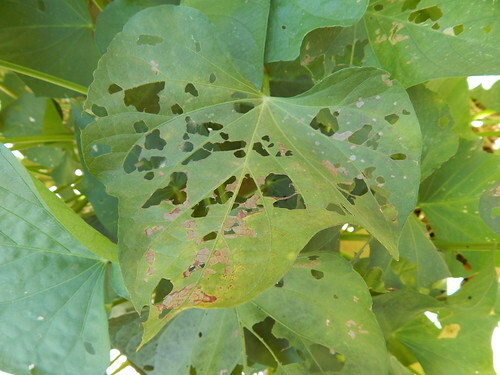 After doing a little research, it sounds like you aren’t supposed to worry about late-season leaf eating pests on sweet potatoes until they are 30% or more defoliated. I don’t think we’re quite there yet, but we may treat anyway. The Dipel (Bt) would most likely be effective here as well. I’ll keep you posted.